We have the perfect solution of brilliant white teeth.60 minutes are all it takes to transform your dull and yellowish teeth to a dazzling white appearance. In today`s era where our appearance is so vital to our success, yellow and dull teeth are totally unacceptable and are considered to be old fashioned. 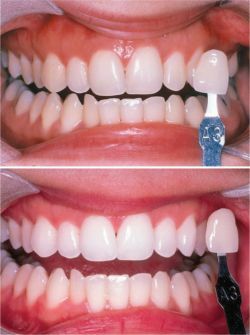 A brief theory about the whitening effect: microscopic intrinsic stained discolorations are present deep within the teeth, which give then an overall dull or yellowish appearance. Such stains are professionally removed by our whitening experts with the use of a peroxide based agent. The peroxide reacts with such stain producing substances there by oxidizing and removing them completely. The gums and lips are protected with special barriers to prevent their contact with peroxide.